My path to Joyologist was not a straight one. After graduating Skidmore College with a degree in English Literature, I spent my early adult years doing an awful lot of “this and that”. I was searching for something but I had no idea what that something was and then one day, a chance conversation with a friend led my to a weekend long course in Ontology, the study of being. There I learned that life doesn’t just “happen to you” and that what you end up with is not a direct result with what you’re born with. Each of us gets to choose our path, what it looks like, how we move along it, and where it will lead. That course was my gateway to a love and lifetime of what’s possible. Through the years I’ve developed some powerful beliefs. It’s never too late (or too early) to have your defining moment. It isn’t always easy, but it’s always worth it. Radical responsibility and accountability are the fastest path every single time. I founded Eat Live Well, a boutique food and lifestyle company where I spent 15+ years teaching hundreds, if not thousands, of people how to cook and why food matters. Ultimately I discovered that while I make a great creme brulee, I found significantly more joy in the spontaneous conversations I had with clients while we were cooking. I discovered that a great many women were dissatisfied with “how life was”. They were going through the motions with the blind faith that someday, one day, something would somehow shift. I found myself applying essential techniques to matters not born in the kitchen, creating recipes for life and living alongside lunches and dinners, real plans with real steps toward real results. And so Live a Joyful Life was born. Then somewhere along the way, I lost my way. On paper I had it all: husband, child, beautiful house in the suburbs, but my marriage was failing and the weight of that was impacting every area of my life. I was overwhelmed by feelings of hopelessness and disappointment. I felt like a fraud, helping women create juicy, joyful lives while my own life had gotten so off kilter. I vowed to do whatever it took to build a life that felt good, one I loved waking up to, and I did that. I did that for my daughter as much as for myself because everything she will know about being a wife, being a mother, being a woman, EVERYTHING, she will learn from me, and her daughters will learn from her. The future of humanity depends on women. So I journeyed back to myself, reclaimed my identity, and transformed my life. I chose JOY and I continue to choose JOY, every single day, for me, for you, for my daughter, for yours. My process is repeatable, sharable and today I am even more effective at helping other women create joy for themselves, whatever that looks like. It’s often a pivot, not a leap. The Million Dollar Question: Can you help me? Yes, I can. Regardless of where you are on your path, I can help you get where you want to go. Whether you are challenged by a curveball that life has thrown your way, transitioning to or from a relationship, or you just want more dammit, I can help. I have completed multiple mastery courses with Tony Robbins, completed and coached the Curriculum for Living at Landmark Education, and continue to sharpen my skills in a program called RMT. Additionally, I was an early graduate of the Institute for Integrative Nutrition, and I am accredited by the American Association of Drugless Practitioners as well as being a certified Health Coach. A lifelong learner, I have invested (and continue to invest) in multiple teachers, mentors and coaches along my journey that bring me to where I am today. 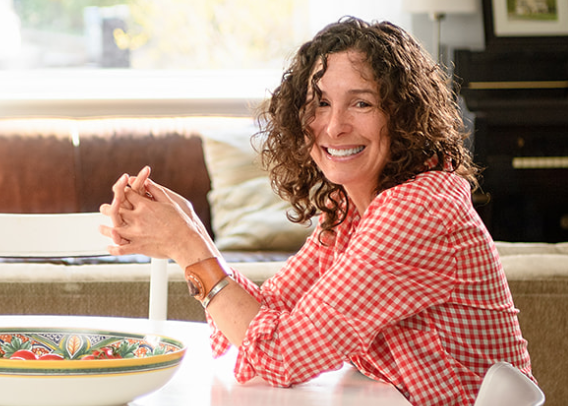 Emily Stulman Klein, founder of Live a Joyful Life, is a Joyologist (positivity expert + joyful life coach), author and chef. Emily’s 25 years of experience in personal development and fulfillment have made her an authority on helping women (and heart-centered men) to stop comparing and start living even when life doesn’t look like the brochure. Emily works with clients both live and virtually, one to one and in groups. Emily lives in Montclair, NJ with her 12 year old daughter, their large brown dog and small gray bunny.